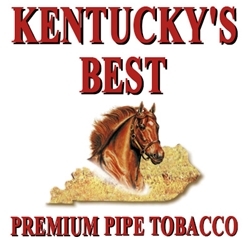 The World’s Best Tobacco Comes From Kentucky! Kentucky’s Best Pipe Tobacco is an excellent blend of top-quality flue-cured, Burley and Oriental tobaccos, possessed with distinctive rich flavors and pleasing aromas. Every Kentucky’s Best Pipe Tobacco is perfectly blended and shredded, cut slightly larger for the traditional pipe smoker, and regular tobacco crowds. This high quality tobacco is made the old-fashioned way, which means it’s made the RIGHT way! Ideal for smokers, Kentucky’s Best Pipe Tobacco focuses solely on traditional taste and strength, offering an easy and mellow feel without the harsh aftertaste. For the dedicated smoker who likes a smooth, rich and satisfying blend, but at a more affordable price, try any of the Kentucky's Best Pipe Tobacco styles today. Kentucky’s Best Pipe Tobacco is manufactured and distributed nationwide by Farmer's Tobacco Co. of Cynthiana, Inc. Each pouch of Kentucky’s Best Pipe Tobacco are available at our online tobacco store in unique styles to choose from. Mint, Original, and Smooth. Every day smokers are switching to low cost premium tobacco smokes as a great alternative to expensive and over-priced retail brands. Kentucky’s Best Pipe Tobacco offers an excellent choice for your money saving needs. Smokers Discounts has made it easy and affordable to buy pipe tobacco online. Call us for more details!